I am a huge Hawkman fan. As a history afficianado and a fan of archaeology as well as sci-fi, all incaranations (except when he was a mad Hawk god) of Carter Hall/Katar Hol have been fun for me. I loved Hawkman's classic look, even the JSA one of All Star comics in the 70s with the different masks to separate him from the Earth-1 Hawkman from Thanagar. I love the idea of using history and ancient weapons/tactics to foil the crimes of today. However, DC has not had much respect for Hawkman and Co. lately. Unlike the Flash, whose silver age and golden age characters coexisted and that dichotomy had been explained, Hawkman's reintroduction into the silver age was so different from the Golden Age character that no one thought of a real way to resolve them. He was made an example of in the Zero Hour crisis when all his incarnations molded into one. That was supposed to fix things, but as usual with DC, more "crises" screwed things up. Well, the latest slap to Hawkman was that to save the Earth in Brightest Day, he and his wife Shayera aka Hawkgirl, were resurrected and became agents of the element of air. Hawkgirl was not returned to human form after the BD debacle, and Hawkman was left to mourn alone and nothing was heard from him for the most part...until now. Which begs the question...in this "new 52" universe, which Hawkman is this? Is it Carter Hall, the reincarnated Khufu through the ages who dies and is resurrected, along with his wife Shayera? Is it the alien from Thanager Katar Hol? It is not quite clear. In this telling of Hawkman, we start with a rather bitter Carter. That may mean that this is post-Brightest Day. He is so bitter he burns his costume. Then we get a weird transition where he ends up in his apartment passed out. Carter Hall is a linguist/historian for hire, it appears. He is called to look at a new find, when trouble occurs. Ut Oh, no Hawkman outfit, you may say! You would be wrong! 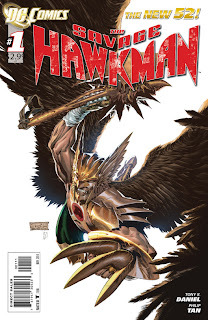 The Nth Metal (see the Hawkman mythos for what that is) of Hawkman's outfit has somehow bonded to Carter, and he is able to mentally create a new costume. Initially, not a fan. Thought he looked like Wolverine with wings and a bad manicure. However, upon seeing it in the story, it is not terrible. However, I do miss the classic hawk headgear and hope for a return. The story ends with Carter, who says he was born and raised in the USA (which neither Khufu or Katar were, so maybe this is yet another version, ugh, or maybe he doesn't remember being reincarnated....who knows? ), at the mercy of a new malevolent force. Why is Carter bitter? Will Shayera show up? What else can he do now that the costume and he are one? Will there be any side effects? And how will Hawkman get out of this mess? Questions this book does not answer, but which I must know. While this is not granddad's or dad's Hawkman, it is still a Hawkman worth giving a shot. If you are, as many longtime readers of DC are now doing, yanking your support by cancelling subscriptions, do not do this to Hawkman....yet. Give it time. It is fascinating and maybe we just might see a Hawk renaissance! 4 out of 5 shields, because it didn't totally take the life out of the character and produce a suckfest like the Superman titles have done.